The Canadian Press also talked to me about the Yantain Express. The Oceans Alliance, consisting of container Lines COSCO, CMA-CGM, Evergreen and OOCL have announced the extension of their Alliance until 2027. The alliance, which formed in 2017, was initially for 5 years, with 2 five year options for extension, both of which have now been exercised 2 years into the Alliance. 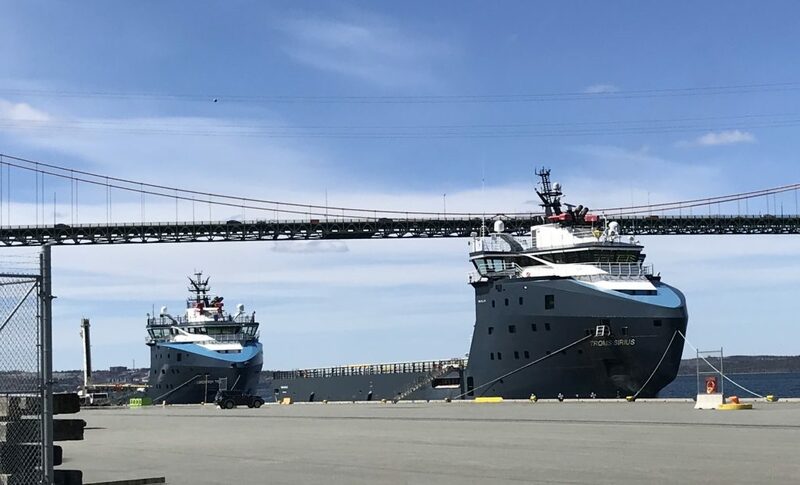 Troms Sirius and Lundstrom Tide ended their Charter to Horizon Maritime and were reflagged and Sailed from Halifax. Both vessels were chartered from Tidewater for use during BP’s exploration program, which has since ended. HMCS Ville De Quebec returned to Halifax Monday, after being deployed to the Mediterranean with NATO. HMCS Toronto sailed to take VDQ’s place on Saturday. The 22nd saw HMCS Shawinigan and HMCS Kingston deploy for 3 months to West Africa. This past weekend, Bernie Smith wrote an opinion piece in the Herald, arguing that Halterm should be moved to Dartmouth. 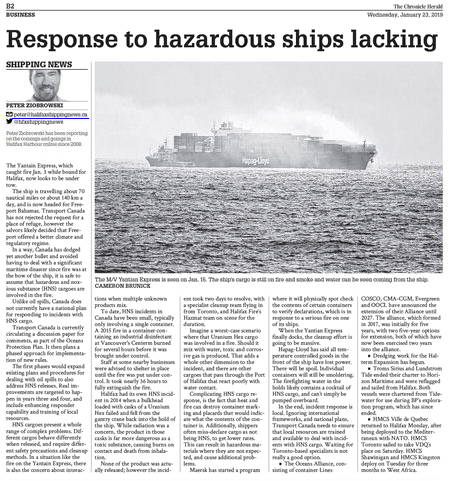 Hes wrong, for a number of reasons, but the big one, is Halifax can have multiple terminals. Another North Atlantic right whale calf has been spotted off the coast of Florida. Fisheries and Oceans Canada says it’s the third calf sighting since December. Jan 21, 1840 – The continent of Antarctica was discovered by Captain Dumont D’Urville. He Claimed it for France naming it “ Terre Adélie “after his wife Adele. Jan 18, 1821 – Halifax Harbour freezes over. This entry was posted in Weekly News on January 23, 2019 by Peter.